Our Country Chronicles: Summer Harvest Has Begun!! 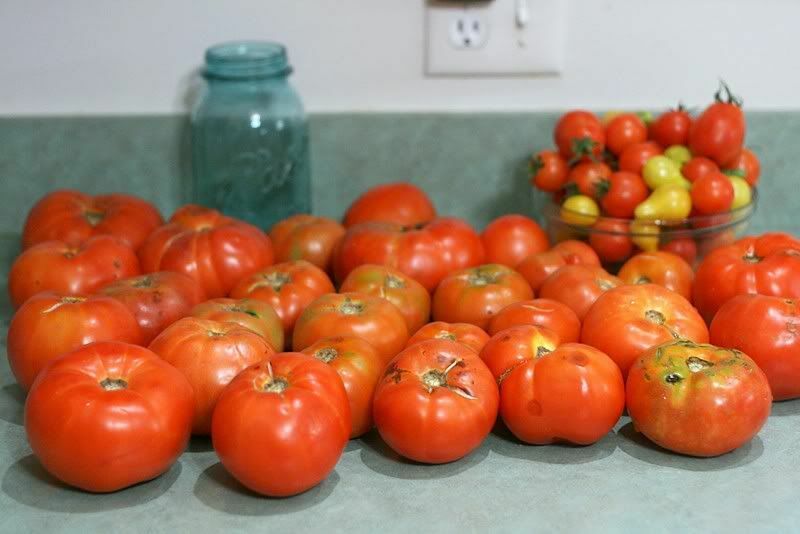 I started with over 1/2 a bushel of tomatoes. What you see here is 1/4 bushel. 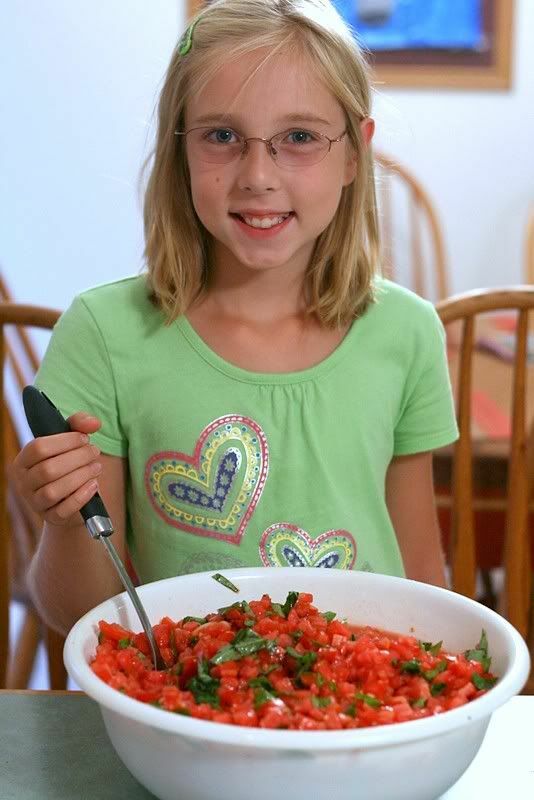 The girls prepped all the basil for me while I diced the tomatoes. Madeline helped me package it all. Sorry, no pictures of her tonight. 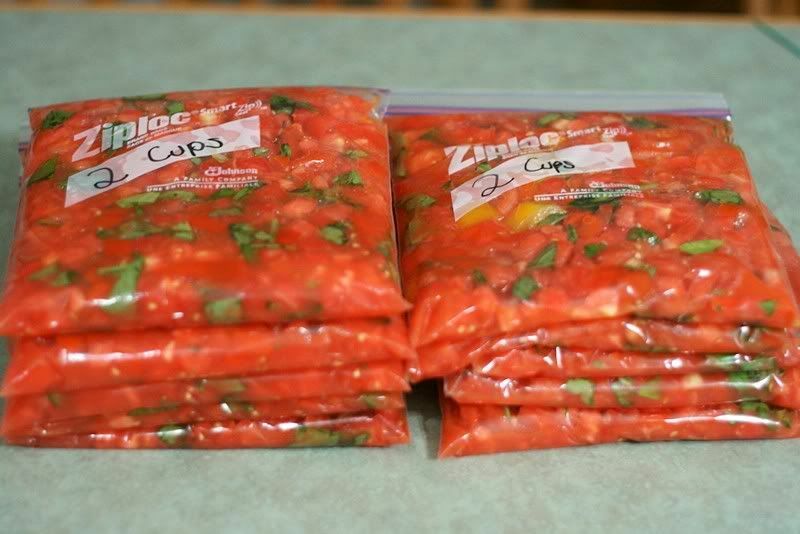 It is much easier than canning, and I actually prefer the taste of it to canned tomatoes. To me, it is much brighter and fresher in taste. My method is this: Dice the (uncooked) tomatoes, skin and all, add fresh chopped basil, melted coconut oil, and freeze (2 cups to a package). This 1/4 bushel yielded 20 cups. The oil protects the basil from turning black in the freezing process. This is what I have left to process tomorrow. When I open these bags of tomato and basil in the middle of winter, it is an utter breath of summer, and essential in helping me mentally make it through the cold, cloudy, and snow filled months of Michigan!! Although I love "the summers end harvest", I do hate summers end. I am a warm weather woman stuck in a cold weather state! I wish Michigan had 3 months of winter, and 9 months of summer temperatures. Before long, I'll be wearing my wool socks and long johns trying to keep warm (which I never seem to succeed at). So it is difficult for me to say goodbye to summer. Wonderful, warm and bountiful summer. *Sigh* Luckily it'll be here for me next year. And my heart breaks at how quickly my babies are growing up. Look at Tara HERE 5 years ago, on the day before kindergarten was to start. She's standing at the same spot at the counter. Stop growing babies!! First of all I LOVE your new header!! It's so cute. And those tomatoes-omg. They look so good. As you know our garden is in the hall of shame of gardens so we're lucky to get enough tomatoes for eating. Maybe next year I'll do it myself. I hate canning so I think freezing is the way to go too. Thanks Gale, and thanks for the header inspiration!! As far as the tomatoes. When it was planting season, we didn't have the money to put in the garden since it all went into the coop, feeders, and feed. Since we live in the country, there are plenty of roadside stands set up. Yesterday, the girls and I went looking for the best and the best we found! I found one that has fresh picked corn on the cob for $3.50 a dozen. The tomatoes came from another stand which was $10.00 for 1/2 bushel. There is another that has fresh herbs, summer squash, beans, tomatoes, zucchini, and lots more. All of their prices are way lower than the grocery store or the farmers markets. I am really glad to have this alternative since I don't have a veggie garden myself this year. Next year we will though! Wow!! That's a LOT of tomatoes!! My girls would be all over them. It was a lot! We love them so much. One of my favorite summer side dishes is "marinated tomatoes. It's simply red wine vinegar, oil, salt and pepper. 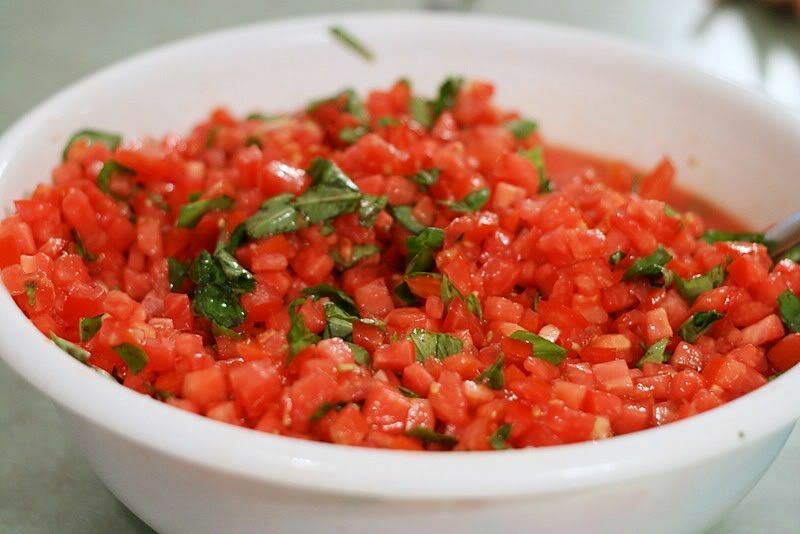 Whisk it briskly and add wedged tomatoes (bite size) and coarsely chopped fresh basil. It is sooooooo good! I love this time of year.